Download either a 3D or 2D version on iOS or Android. The world's most advanced graphics available on mobile. Texas Hold'em ring games for cash or just play money. $5 instant bonus to try the app for free on your phone. 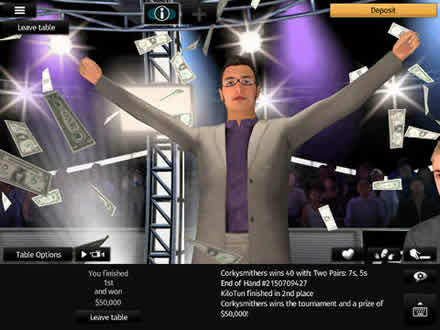 Some poker sites are widely considered to be innovative and have become known for one or two improvements or new variants of the game they’ve unleashed upon the online poker world – but so far only PKR has really dared to go beyond the tried and tested formula of two-dimensional graphics and simple, streamlined gameplay. 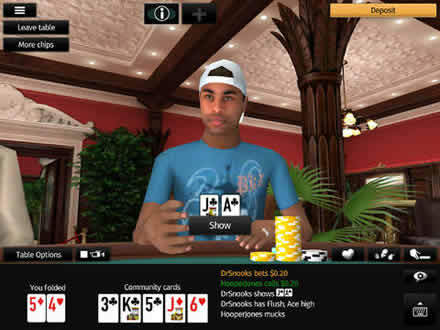 The idea of PKR poker applications has always been a simple one – to bring us a new, realistic, completely three-dimensional environment with player avatars which cease being nothing more than abstract icons and can be used to gesture, taunt and generally speaking liven up the game. Now, the advances of smartphone technologies have allowed the company to release a completely 3D Android client, bringing this new approach to our favorite mobile devices. The first step towards playing poker PKR style is to download and install its unique software package. You can choose to install the full 3D version that weighs around 400 Mb or instead opt for the smaller 2D version that is less than 50Mb. 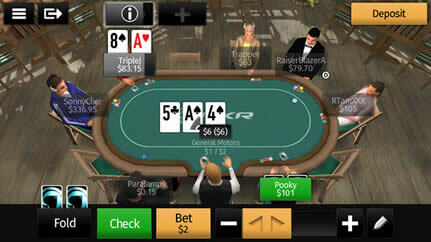 The PKR 2D poker app allows you to experience all the same great features but with far less memory and bandwidth usage. New Android devices like the Samsung Galaxy S6, HTC One or Google Nexus will have no problems running the software. If you're using an Android device that is a few years old, we would recommend you stick to the 2-dimension version. Aside from the stunning visuals and innovative gameplay, PKR offers plenty of interesting welcome bonuses that are sure to appeal to all kinds of players. The Starter bonus offers you $5 free and is recommended for beginners, while the Intermediate package will give you up to $125, which is a 100% match on your first deposit. Last, but certainly not least, high-rollers can take advantage of the Advanced welcome bonus of up to $500, which is a 150% match on your payment but requires you to make a first deposit of at least $150. Aside from that, PKR offers free tournament tickets, a neat refer a friend program and a lucrative set of promotions for returning customers. The first thing you’ll notice upon launching the PKR 3D Android poker app is the fact that unlike other sites, PKR doesn’t force you to sign up for an account to try out the software – all you need to do to skip the login screen is to click the Browse as Guest button and you’re good to go. The lobby allows you to jump straight away into the games in either Play Chips or Real Money mode, adjust your account settings or access the preferences menu, which is located in the upper-left corner of your screen. This menu allows you to pick between the traditional and 4 color deck, adjust sound FX, dealer voices and player voices and toggle lobby music on and off. 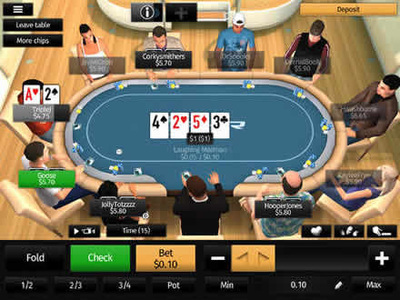 The app also includes a neat explanation of the rules, so if you’re a poker newbie don’t worry – PKR will guide you through the first steps of learning the game. Picking the poker game you want to play is as simple as selecting one of the three massive buttons filling most of the screen in the lobby. Switching from play money to real cash is achieved by clicking the tab located at the top of the screen. It’s important to point out that playing for real by mistake isn’t really possible, since switching between both modes changes the color of the backgrounds and buttons. 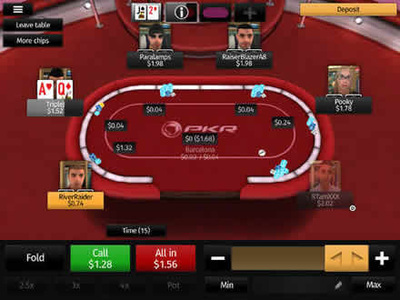 Unlike other Android poker apps, which tend to focus on a single variant of the game, PKR offers a lot in terms of variety. The available games include No Limit Texas Hold’em, Pot Limit Omaha and Pot Limit Omaha Hi/Lo. All those games are available both in cash game and Sit & Go format. The stakes range from as low as $0.10/$0.25 to as big as $5/$10, so poker veterans and high-rollers definitely should be satisfied. What’s more, you can choose whether you want to play heads-up, short-handed or full ring games. All in all, the package provided here is exceptionally well rounded and can easily put other mobile apps to shame give that is supports both MTT and Sit & Go tournaments. Despite the massive number of available poker variants, the main attraction of PKR poker are the incredible graphics in table mode. The 3D models representing the players are exceptionally detailed and can be easily customized, which might give you a hint as to what kind of person you’re facing at the table. The action itself is smooth and isn’t harder to follow than in other rooms that still use a rather abstract, classic, two-dimensional layout. The only issue I’ve had with PKR 3D Android poker app is the fact that there’s no multi-tabling functionality, but in the end this room is more about immersion than grinding eight tables all at once. As you’d expect from a poker site based on new technology that hasn’t gained the recognition of the poker community yet, the competition on PKR is extremely fishy. Quite obviously, you’re going to find plenty of recreational players drawn in by the eye candy – so if you have some skills or you’re willing to learn, odds are high you’ll become a winning player right off the bat. The traffic isn’t particularly impressive, especially when it comes to practice games, but all in all finding a suitable table isn’t all that hard even outside the rush hours. All things considered, the PKR 3D and 2D Android poker app is way more than a gimmicky demonstration of new technology – it’s a mature, extensive poker client that offers unrivaled variety in terms of available games. Whether you care about the eye candy or not, if you enjoy poker you’re going to appreciate how close to a desktop-based client this app is when it comes to functionality - and the soft player pool certainly doesn’t hurt either. To put it simply, if you have the hardware to run PKR, you’re in for a treat.